This is what got started it. Got things rolling. The questions. Reaching conclusions too quickly is dangerous. And sometimes, reaching any conclusion at all can be just as bad. Doubt is good. Question everything. Never know what you might find. Problem is, some people don’t like active questioning. At least that's my perspective. People who raise their hands have a habit of getting thrown out of organizations, professional or otherwise. And common sense shows that when people are deeply attached to conclusions that were reached a long time ago, things can get... "emotional". Maybe with all the renewed excitement, people will think. And not be afraid to continue to ask questions. He reckons his record was 50-1. Yeah, it's a little confusing. "His father became a gangster and abandoned his family, and his mother won custody of her sons and moved them to Berkeley." The confusion is from watching the interview because it sounds like his father didn't abandon him. Maybe I'm missing something or not hearing it right. Pretty interesting interview between Seth and Diane on D3m0crAcy N0w. A good, civil exchange. Makes me want to pay attention to how this unfolds. He looks like he couldn't take out a Tickle me Elmo doll but maybe that's one of his advantages. Fighting is 95% mental with 90% of that 95 being the ability to pull the trigger and shoot your fists,knees feet and elbows at someone. A little more than a month ago, I grabbed a paper, along with my precious cup of coffee, and sat down to look at the headlines while sitting outside, under the redwoods. Everybody at the coffee shop seemed mellow and friendly enough, smiling at the jokes and maybe even saying 'thank you' when the extra change was dropped into the tip jar. So, I was alone for a few moments, at a table outside, sitting on one of the cheap, plastic chairs. I glanced at the headline. And everything had new meaning. 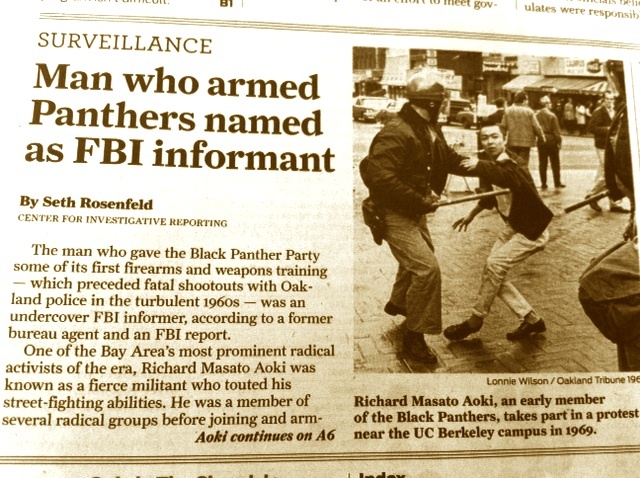 I saw the Black Panther Party and looked at Aoki's protest photo (think it's from the Third World Alliance activity) and naturally thought of blog posts, comments, and dialogue these past two years, starting with Loco. Read what can be seen in the top photo and continued on to page A6, and finished reading Seth's piece. I remember thinking, "Damn, so the FBI infiltrated and set up the BPP...The Man was working hard." After watching more recent discussions as well as watching Dr. Fujino's presentation at San Francisco State University on September 13, I've got even more questions. Diane mentions when looking at the headline that's in the news article, it is easy to infer that Aoki was a provocateur. She's got a different angle the picture, as she'd just published Aoki's biography; he's definitely quite a character. Initially, she seemed very 'not happy' about what Seth said he thought he saw. And only recently, after Seth and Diane's D.N. interview, new information has been put out. Even she says the jury is out on this one. She makes a few other points that resonate in a general sense when she talks about the need to read carefully and critically, etc. But, yeah, Aoki's background is pretty interesting. Apparently he had THAT ability. If you are talking about the SF Chronicle article, I read it and thought to myself: What a bunch of mucky convoluted stuff! I will have to admit Aoki has a talent with vague details and dancing around things in conversation. I'm not saying, yes. But I am not saying no. Gah! Yes, I am talking about Seth's article published on AUGUST 20. Apparently Rosenfeld has been taking heat for this. 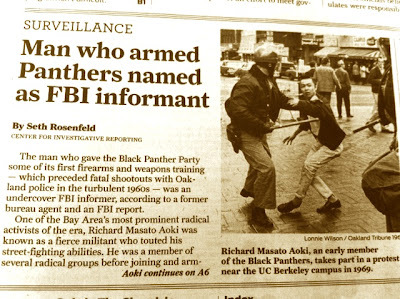 Headline - Man who armed Panthers named as FBI informant. Democracy Now hosted Seth and Diane, where Diane questioned Seth's evidence,"The evidence needs to be substantial, there needs to meet a certain burden of proof and it did not in this case." She goes on to say that she was privy to the same documents Seth used for his book and casts doubt on their interpretation,"I have the same document retrieved under the Freedom of Information Act, the 1967 document, and it is the ONLY FBI document that Resenfeld cites..." she goes on to say that, based on those documents, "It is unclear whether Aoki is the informant in this case or the one being observed." Wanting elaboration for evidence she understands to be inconclusive, she states "I feel the evidence is not there and that more needs to be provided in order to meet the burden of proof." 221 pages of more material released that appear to name Aoki as an informant with 16 years of cooperation with the FBI. Yowza! I'm thinking about Fred Ho, the artist, what he says. "Accept the truth, no matter who the messenger is and how it's delivered. If you rant and rave and scream and yell and swear at me..."
He's got more advice, but this reply is getting kind of long, so I'll leave it at that.